Still from "We Are The Best!". Courtesy of the Toronto International Film Festival. Still from “Exit Marrakech”. Courtesy of the Toronto International Film Festival. Mature treatments of coming-of-age stories by international filmmakers are a staple of the Toronto International Film Festival (TIFF), and this year was no exception. On Day One of TIFF, I saw the touching German film “Exit Marrakech,” directed by Caroline Link (“Nowhere in Africa”), about a privileged German 17-year-old Ben (the very handsome Samuel Schneider) who is summoned to Morocco one summer by his absent father, Heinrich. In Morocco, Ben wants to meet people and see the real country they live in, while Heinrich prefers to read about it from his luxury hotel. When Ben meets a beautiful young prostitute, he impulsively follows her home to meet her family, worrying his father and putting himself in danger; Ben is diabetic and embarked on this adventure without necessary preparations. In the Q&A following the screening, Link noted that she liked the idea that Ben was forced to grow up and be responsible both from emotional circumstances – his father’s departure and his mother’s demanding career – and physical necessities: managing diabetes means he can’t be as carefree as he may hope to be. What follows is a coming-of-age story and a buddy road movie, as Ben embarks on his own adventure and then later meets up with his father. They try to mend fences against the beautiful and foreign backdrop of Morocco. Still from “Ilo Ilo”. Courtesy of the Toronto International Film Festival. Also on Day One, I saw the moving “Ilo Ilo,” a film from Singapore about a trouble-making young boy and his relationship with his Filipino nanny. There are similarities here to the premise of Swedish auteur Lukas Moodysson’s 2009 film “Mammoth” about upper-middle-class white guilt, but this film is much more tender, with characters who are less selfish but still troubled by circumstances. The young boy stirs up trouble as a plea for attention, while his parents are too absorbed in their own troubles to help him; the father is in a financial mess and can’t seem to communicate with his wife, which only incurs her wrath and makes their relationship unstable and hurtful. When they hire a Filipino nanny, who has left her own son to come to Singapore for the job, the young boy hazes her before discovering that she is the only one willing to spend time with him and provide the attention he so desperately needs. There are no bad guys in this film where everyone gets hurt. Each person aims to hurt the other as a means of deflecting his or her own pain. Still from “Like Father, Like Son”. Courtesy of the Toronto International Film Festival. Japanese director and TIFF favorite Hirokazu Koreeda had the North American premiere of his new film “Like Father, Like Son,” which won the Jury Prize at Cannes, on Day Three. It’s a switched-at-birth story that does a better job of dealing with the complexities of what it means to be a parent and connected to your child than it does in dealing with the logistics of what to do when discovering your child was switched at birth. The film is told from the perspective of one of the fathers, Ryota, a business hotshot who can provide material goods but is rarely around. He is in the process of putting his son into private school when he discovers that they are not biologically related and thinks that he finally understands why he feels disconnected from his son. The other family is poorer but warmer: they have two other children and spend quality time with them. The two families decide to try out swapping children on the weekends as a stepping-stone to a more permanent situation, which augers trouble. How can they pull a boy away from his younger siblings he grew up with? And once both families have spent time with both boys, how can they prevent becoming attached to both of them? And what about the children’s feelings? Ryota behaves abominably by brow-beating all parties into a switch that can’t possibly work out in the long term, hurting everyone in the process before they can mend it. In the Q&A following the film, Koreeda explained that his work was inspired by an experience he had while shooting his 2011 film “I Wish,” also about children, which took him away from his young daughter for over a month and created a schism in their relationship. The movie’s central idea is that blood ties and privilege matter less than quality time, because quality time is more important for children. This is a thoughtful and moving exploration of what it means to be a parent, but the selfish behavior of the protagonist is hard to forgive. Still from “We Are The Best!”. Courtesy of the Toronto International Film Festival. The festival’s best film about adolescence, and indeed one of the best films of the festival, had its North American Premiere on Day Five. Lukas Moodysson’s buoyant, funny and touching “We Are The Best!” is a screen adaptation of a graphic novel by his wife about her own childhood. 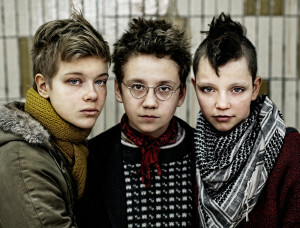 The film tells the story of three 13-year-old punk rocker girls in 1980s Stockholm who decide to form a band. Tags:Caroline LinkExit MarrakechFilm festivalsHirokazu KoreedaIlo IloLike FatherLike SonLukas MoodyssonTIFFTIFF13Torontotoronto international film festivalWe are the best!